Slow down, catch your breath and relax in our comfortable, fully-appointed, BEACHFRONT townhouse. 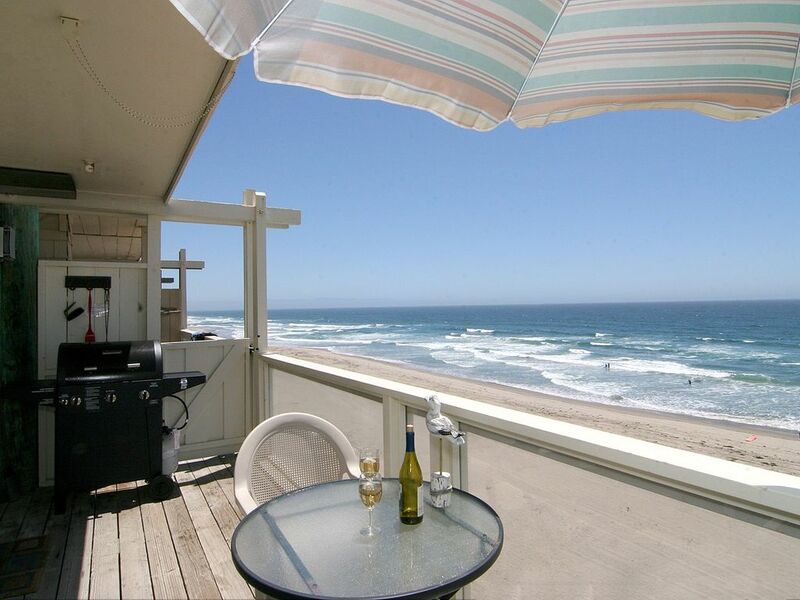 Your deck overlooks the wide, sandy beach and beautiful Pacific Ocean. You can walk for miles along the beach, watch the dolphins, whales, and other sea life from the comfort of your living room or private deck. Small, private, townhouse complex; quiet and peaceful surroundings. If you love to listen to the sound of the surf as you fall asleep at night or enjoy a, uncrowded, semi-private beach, this is the place for you. And if you're looking for some social time, our home is Ideally located close to the restaurants, wineries and activities in Santa Cruz (15 minutes) or the history, shopping and boutique wineries of Carmel and Monterey (30 minutes). King bed in master bedroom; one queen and one full bed in second bedroom. Both bedrooms feature very large windows with a fabulous view of the sandy beach and ocean waves. Linens provided. Extra pillows and blankets available. Kitchen offers a breakfast bar, microwave, coffee maker, dishwasher, all cooking amenities; two full baths. Your comfortable, casual living room features a chill-chasing Norwegian Jotul fireplace, flat screen cable TV with DVD, and stereo/MP3/CD player; wifi connection for your tablet or laptop. Upscale, soothing beach decor throughout. Kick off your shoes, chill the drinks, and make this clean, cheerful, beach-themed cottage your home -- it feels more like home than the vanilla rentals you've stayed in before. We have owned our beach house since 1972 after searching numerous vacation spots throughout California. We decided on Santa Cruz area largely because its proximity to Silicon Valley and the ease in getting there to start the weekend or vacation without a long, tedious drive. Also for travelers, it's only an hour's drive from San Jose or Monterey airports. It is only 5 minutes off scenic Highway 1 which runs along the Pacific Ocean from Mexico to Oregon. We purchased this property to get many of the features we experienced in Hawaii, without the expense and hassle of long travel. We also wanted to be close to Carmel and Monterey. It's easy for us to manage, as well as vacation there, as we live in the redwoods 20 minutes away. Many of our guests have been renting from us for 10-20 years. A few have even decided to purchase there, and are now our neighbors! Near state parks, but very non-congested. Our family-friendly home offers the unique experience of staying ON a natural sandy beach. Amazing views, the ability to walk out of your home and onto the beach (one minute) for a walk or run. Try your skills at surfing, boogie/skim boarding or surf-fishing. Or spread your blanket on the beach right in front of your home and watch sun light up the waves as they crash at your feet. In the evenings you can build a beach fire and share the day's adventures with your family and friends. If you prefer to lounge on the deck, you can watch the birds, whales, sea lions, otters, etc., from the comfort of your own private space. Linger a moment to watch the sunset, breathe the fresh ocean air, let the waves mesmerize you. Many families revisit our home each year to reconnect with themselves and their families. A rare experience indeed! This oceanfront town home is located on a highly desirable beach approximately 8 miles south of Santa Cruz. Property is located on a private road; non-through traffic. Spectacular views from large bedroom windows, living room, kitchen and oceanfront deck. Wide, sandy, natural beach stretches for miles right in front; panoramic views. All linens provide. Extra pillows and blankets. Free parking for 2 cars directly in front of unit on parking pad. Additional parking on street is available with owner-supplied permit. Secure wifi connection throughout the home. Living has pull out couch that can be used for additional sleeping arrangements. Cards and board games provided! Million dollar view from the deck off of the living room/dining room/kitchen area. Ocean breeze, sandy beach as far as the eye can see, crashing surf, whales, dolphins, sea lions, pelicans, Wow! Enter our beach house from the parking pad; step into the entry; both bedrooms and one bathroom are directly off of the entryway. No stairs or obstacles. The main living room/dining/kitchen and second bathroom are down a flight of stairs. Ocean view deck is off of living room at the same level and is easily accessible. Came here with my sister and 3 nieces for a girls weekend and had such an amazing time! The house itself is beautiful and has everything you need for your stay. Bedrooms are a great size and nicely decorated. Kitchen has plenty of plates,utensils and cookware. The beach is literally a few steps away and almost feels like you have it to yourself as there weren’t many people around. It did rain for most of the weekend but that didn’t dampen our spirits and it was lovely to take a walk in between showers and collect some shells!! There were quite a few board games and puzzles to keep my nieces entertained and let’s just say I’ve never played so many games of Chutes and Ladders! !😃�😃�😃� There was also a lovely welcome gift of wine and chocolate which was such a nice touch and also chocolates in the bedrooms upon our arrival. All in all I would give this property 5 stars!! We made some great memories and cannot wait to come back!!!!!! What an amazing way to spend Christmas Eve and Day. We were allowed to bring our husky and she loved the morning run on the beach! The townhouse was really nice, very clean, and very homey! I enjoyed just watching the waves either from lying in bed or sitting in the living room. Very relaxing time for my family. We played games we had brought along, took dog to beach frequently during the day. I could have spent a full week right there! Hope to be back during the summer next time. Thank you for the positive and detailed review. We appreciate it very much! We arrived late in the evening and the property was pretty easy to find... The beach house was clean, nicely decorated and the views were magnificent! There was plenty of space and accommodated 5 women easily. The owners left a gift basket and wine and a personalized note which was thoughtful! We had a couple of needs, such as bath towels and batteries for the fire remote and the property manager (Kayla) was swift and reliable with our needs. We were able to do day trips north and south to Monterrey, Santa Cruz and Altos to see the Redwood trees... but our favorite destination was outside our balcony down on the beach! We saw numerous whales feeding not far off the beach each day we were there which was phenomenal to witness! The beach was sparsely populated and most times in early morning walk we had the beach all to ourselves. If we had to do it all over again we'd stick up with wine and food and stay all days at the beach house (the traffic was frustrating, as it took a long time to go short distances)... it was a little slice of heaven! We definitely would love to return again sometime in the future. Thank you for a memorable birthday trip! The beach house is absolute paradise and out family was sad to leave. The beach goes on for miles and we were often the only family on the beach. We had plenty of room for 2 adults and 3 children, sleeping comfortably. The kitchen is well stocked and barbecuing on the deck is picturesque. Our family will certainly be coming back to the La Selva beach house. I really wanted to leave a five star review, but . . .
My wife and I thoroughly enjoyed our stay here with our two young sons. We created amazing memories grilling on the patio while watching whales spout in the distance, and the collection of sand dollars we gathered was pretty impressive. We were initially welcomed with a basket of goodies and wine, which we very much appreciated, and our general sense is that the owners and property manager are both friendly and welcoming. As other reviewers have mentioned, the location is excellent for access to both Monterey and Santa Cruz, and because it's off the beaten path, it felt like we had miles of beach to ourselves. However, considering the rates, there are a few things that were annoying to us. First of all, there is a surcharge for linen service, which is in addition to the cleaning fee. I'm not sure what the alternative is - we bring our own sheets and towels? Anyway, we paid the additional fees up front, along with our rental fees and the security deposit. Several weeks and several emails after our stay, we received part of our security deposit back, but the linen fee was deducted from our security deposit, despite the fact we had already paid it. I followed up with the property manager, who acknowledged her mistake and indicated she would forward the difference to me right away. Several more weeks have passed and we ave yet to receive the remaining security deposit back. Another thing we were frustrated with is that the jetted tub doesn't work. My wife was looking forward to using it, but the jets weren't functioning. Finally, the TV/internet wiring is quite interesting - there aren't enough outlets to operate the TV, wireless internet, and sound machine, so you get to play musical plugs depending on what you want to have working at the moment. Another power strip would easily solve that problem. We eventually got the wireless internet to work, but couldn't figure out how to operate the TV, which was probably a good thing anyway - after all, this place is ON THE BEACH! I don't want to discourage anyone from renting this place - it's like a good spouse/s-o. Wonderful, but with some overlookable flaws. Glad to hear you enjoyed the million dollar view, the beachfront setting and the efforts we’ve made to make our guests comfortable. We’d like to respond to the issues that you kindly raised. First, the linen fee. We have been renting our beach home for 32 years and many (over half) of our repeat guests have taken advantage of our flexible plan of saving the linen fee by bringing their own. Our cleaning fee and linen fee are quite reasonable compared with other rentals in Santa Cruz. Other properties do not offer this option and charge more than our combined cleaning and linen fees. We’re so sorry the jetted tub was not operational during your stay; we were unaware it was not working. If you had reported this to us, we would have had it repaired immediately. The tub was promptly repaired and our subsequent guests have enjoyed using it. We recently upgraded our DVD player and, were unaware that there were not enough open outlets to handle the capacity. You're correct, this was easily remedied with a larger power strip. It has been replaced and all is working well. There was additionally some confusion regarding the linen fee due to a discrepancy between what was requested and reflected on the contract and what was paid for. This just needed to be verified and once it was, the remainder of the deposit was returned. We thank you again for your honest review and the opportunity to continue to enhance our guest's experience. This condo was the perfect beach vacation home for our family of 4. It had everything we needed for the trip - kitchen was equipped really well and was clean and neat. Both the bedrooms faced the ocean and it was so relaxing to fall asleep to the sound of waves. The location is simply unbeatable to drive to all the nearby attractions - Monterey, Carmel and Santa Cruz. Would definitely recommend this condo and we would love to have the chance to stay there again. whale and wildlife watching, beach combing, wave gazing, relaxing! $40/night pet fee (1 pet maximum). No pets allowed without prior approval. Rental amount does not include 11% occupancy tax; please contact owner directly for availability, pricing and special offers.